Catholics don't have much of a problem with this text. As they read it, this passage confirms their view that the church, in carrying the authority of the apostles, has the power to "bind and loose" sins on earth (see also Matt. 18.18). But what are Protestants to make of this passage? According to the way Protestants read the bible this exhortation of Jesus to his followers wouldn't have been narrow--aimed at only a few--but wide, aimed at every Christian and not just at the apostles (and those representing them on earth). If that's the case, then ordinary Christians have the ability to forgive sins or withhold forgiveness from each other. Which is a bit of a head-scratcher. Isn't Jesus the one who is forgiving my sins? And didn't he already forgive my sins on the cross? If so, what's this business about fellow Christians not forgiving me and leaving my sin outstanding? My Catholic readers are, I'm guessing, enjoying this. This is one of those texts that Protestants just ignore because it gives them fits. One of the problems with Protestantism, particularly evangelical Protestantism, has been its overemphasis on Jesus forgiving our sins. That is, it is assumed that forgiveness really is just between you and Jesus. This is the classic individualistic emphasis--It's just Jesus and me baby!--we see throughout Protestantism. The point being that Protestants have tended to ignore, often completely, the communal facet of forgiveness. We should care for more than just the forgiveness of Jesus. We need to care about becoming a community of forgiveness where we forgive each other. And I think in the text above Jesus really ups the stakes on this, suggesting that failing to become a community of forgiveness--failing to forgive each other--will have eternal consequences. When we fail to forgive each other on earth nothing in our private experiences will Jesus will wipe away that sin. Until forgiveness is experienced among our brothers and sisters that sin, in some form or another, remains on the books. If we want forgiveness, Jesus is saying, it's up to us. Now that last line is pretty alarming, but work with me here. That is to say, before we do anything as Christians, before we pray, sing, worship, take communion--before we do anything--we work on being reconciled with each other. Because this reconciliation--the giving and receiving of forgiveness--is what defines this community as a Jesus-following community. It is in the forgiveness of sins, extended by each to all, that makes the community a church. All others communities where reconciliation is postponed for worship, song, sermons, prayer, classes, ministry or communion are false churches--pseudochurches. And the reason why reconciliation is so central is because, if we take Jesus literally, if we haven't forgiven each other ours sins remain outstanding--unforgiven on earth and in heaven. That is a radical notion, but stay with me a bit more because what I want us to appreciate is the moral genius at work here, the practical outworking of how this idea creates the Kingdom of Heaven on earth. To be concrete about it, imagine I sin against Joe. And let's say Jesus's formulation is literally in force, that the reality of the situation is that if I want God to forgive me I need Joe to forgive me. If that's the situation then let me bring us to the million dollar question: How might that formulation energize my desire to be reconciled and at peace with Joe? I know it'd be a big kick in my pants to get right with Joe. My reconciliation with Joe is no longer optional or something that can be postponed, perhaps indefinitely. Suddenly, my reconciliation with Joe has become deeply intertwined with my reconciliation with God. Outstanding sins on earth become outstanding sins in heaven. And I wonder, as we think about this, if this might be the genius of what Jesus is saying, exactly what he was getting at. Because isn't the problem with Christianity that we want God to forgive us but we don't care about being reconciled to others? Isn't it much easier to pray to God for forgiveness than to put in all the time and relational work to live at peace with others? What if Jesus is saying that forgiveness on earth has eternal consequences. What if Jesus is saying that it's in our relationships with each other where our sins are truly forgiven. Forgiveness in heaven might be irrelevant if you don't forgive each other on earth. Why fall down at the altar asking God to forgive me when I need to be falling at Joe's feet asking him to forgive me? Isn't that exactly what Jesus is saying in Matthew 5? Isn't Jesus saying that Joe's forgiveness is more important, more pressing, and more vital than the forgiveness of God at the altar? Let me give another illustration of this. Imagine you are a parent with your small child at a playground. Your child gets into a little fight with another child and punches, as little kids can do, the other child. You jump in to scold your child. Your child, feeling contrite, looks at you and says, "I'm sorry." Well, what would any good parent do in that moment? I know what I've done. I say, "I appreciate that, but you really need to go say sorry to that little boy over there." I think this is what Jesus trying to say. Jesus is effectively saying, "As God's representative on earth I forgive you. So you don't have to worry about that anymore. You don't have to go to the temple and make sacrifices anymore to secure God's pardon. In my life, death and resurrection I've ended your need to seek forgiveness from God. For I have forgiven you. Now you are released to live out that forgiveness with each other. Those are the actions--your forgiveness of each other--which will determine your eternal destiny. How you forgive on earth is how you will be forgiven in heaven." I think that's a fair interpretation of Jesus's message. Consider the Parable of the Unforgiving Servant or Jesus's consistent refrain that "as you forgive others so you will be forgiven." And here's the deal, even if you reject this strong formulation it is indisputable that if I restrict forgiveness to what happens between God and myself energy and urgency is sapped from seeking forgiveness from others because that just isn't my most pressing concern. I think we've seen the practical effects of this all over the place. I sin against Joe and then seek forgiveness from God in prayer. I never really get around to seeking reconciliation with Joe. That's just not my central concern. And it might not be a concern at all. To conclude, there is an objection here. What if Joe doesn't forgive me? Can Joe hold a sin against me keeping that sin outstanding and unforgiven in heaven? And if so, wouldn't Joe be holding my eternal destiny in his hands? If Joe's keeping the books on me and Joe doesn't wipe my slate clean then what is going to happen to me in heaven? Three responses. First, if your overriding concern is saving your own skin rather than working on your relationship with Joe then you've missed the point of everything we've been talking about. Quit worrying about hell and go talk to Joe. If you do that trust God that the rest will be taken care of. Just go talk to Joe. Second, we have to remember the symmetry of the situation. Joe is commanded to forgive you. And if he doesn't Joe's damned himself. You don't have to worry about if Joe does or doesn't forgive you. You just have take care of your side of the equation. As Paul says, "as far as it depends upon you live at peace with everyone." Finally, we have to keep the communal focus in mind. It's a community of forgiveness that we are imagining. A community where I am to forgive Joe and Joe is to forgive me and there are others around us helping us both to do this. That is, I don't think it's best to think of two people keeping score. I think what Jesus is doing in John 20 is giving us a picture of the Kingdom of Heaven on earth. Sure, any given expression of this will fall short of the ideal. But that doesn't take away from the vision of what Jesus is calling us to, that if we want God's forgiveness in heaven we should be focusing on forgiving each other on earth. By ending the temple sacrifices God pushed forgiveness out of heaven and onto the earth--out of the temple and into the church. A community of forgiveness replaces sacrifices on an altar. But I want to end by coming back to that scary question I raised above. If Jesus's formulation is literally in force, does that not mean that I hold your eternal destiny in my hands? And does that not also mean that you hold my destiny in your hands? Does it mean that we are all mutually holding our collective destinies? On earth and in heaven? I wonder if that isn't exactly what it means. Forgiveness is the easier part for me; reconciliation has proven more complicated, in my experiences at least. Typically, distance in a relationship results not so much from an unforgiving heart but from my perceived inability to reconcile the damage. Am I so unusual in this regard? Forgiveness is first a willingness in one's own heart and mind to be merciful and generous and brave. It is a beginning, an inner work of God's Spirit, through prayer and contemplation (i.e., reading/meditating on Psalms of lament.) But the process of mutual healing and restoration of a relationship or community or nation is not so simple, often, as a playground spat between young children. Depending on the age of the child, and his ability to comprehend the teaching, I would have gone beyond just insisting that the offender apologize (say 'sorry') to the one whom he hit. Especially at this (older, wiser) stage of my life and parenting. I would spend a lot more time and attention in comforting the injured child, and less time telling my child to apologize on the spot. Later on, at home, I would engage in a lengthy conversation about what happened, why it happened, how the conflict might have been handled better. Essentially, helping my child learn from it, and building empathy/compassion in my child. Dr. Beck, if I never allowed myself to receive communion until all the broken relationships in my life were restored, I could forget about going to church. Probably ever again. D'oh! That'd make me sad, really. I think I'd be in an even deeper despair and lose hope altogether, if I were not able to worship and feel a part of a loving community, in spite of my ongoing imperfections. Once, I was involved in a discussion with a person who has been strongly influenced by Buddhist thought. She shared her vision of the afterlife -- in which all souls literally become one with God. I found that interesting to contemplate. In heaven (or hell), we're not separate beings but merged into one, with God's overwhelming essence permeating the whole ball of wax. opposed to the finished work of Christ. Now, I certainly realize the need to confess our faults to others. We have pretended for far too long. However we are afraid that if we confess our faults one to another that we won't seem spiritual. I noticed something like this recently. For a variety of reasons -- one of which was deteriorating relationships at my church -- I decided to start attending a different church. It was hard to leave, but it was much easier than it would have been to stay and work those relationships out. While I am much happier in my new place, I am concerned with my decision nonetheless. What I said to the world, and to the church, is "If relationships break down, go somewhere else." As much as guilt imperils our souls, the assumption that we are fit to play the judge is a burden that is far more dangerous for us. If we don't forgive the burden will crush us totally. Brilliant exegesis. This fits perfectly with what I found going through my first 12-step program. In fact, I'm going to read this to my current step-study group this week. Your emphasis on the relational quality of forgiveness is brilliant. In order to forgive, we must first be forgiven. Too often we think that forgiveness means we must forgive others. Eventually, that happens, but the deeper and more challenging meaning is that first we must receive forgiveness from God -- and most of us don't think we need to be forgiven! Only sinners can forgive! The ability to forgive others flows directly from our having been forgiven by God; as you put it, "Now you are released to live out that forgiveness with each other." "While I am much happier in my new place, I am concerned with my decision nonetheless." I empathize. I left for a variety of reasons, most fitting under the rubric of "I don't want to endorse this as church anymore." Some people were angry with me for calling out some of their attitudes as sinful. They probably felt slandered. Our faiths appeared to me to be almost polar opposites, and I still can't figure out how any reconciliation is possible. Others made me angry by their unwilliingness or inability to grapple with sins and complacency, but I hardly felt sinned against any more than the world in general can feel sinned against by a lost church in general. I'm disappointed --- maybe resentful. I don't know what I'm supposed to do about that either. My new congregation places a big emphasis on reconciliation. I can't escape the fact that I have a "bad relationship" with Churches of Christ and evangelicalism, but I don't know if "reconciliation" is the right word for what needs to happen. Can't remember who said it, but the Orthodox view is that "We are all saved together... we go to hell alone." I wonder if you have ever been to Forgiveness Sunday vespers. It's when Lent "officially" starts, technically the first Monday of the first week of Lent, though the service is typically in the early afternoon on Sunday for my congregation, because so many people travel 30 minutes or more to my church, so we just stick around after Liturgy and after eating our final cheesy meal for 7 weeks. Every person in the congregation, including priests, bows as low as they can - often to the floor - before every other person in turn and says, "Brother/sister, forgive me." To which the other responds, "God forgives." - which is always true, as you note. It's optional to answer "...and I forgive you," because the truth is that sometimes we are still in the process of forgiveness; but in Orthodoxy, forgiveness as quickly as possible is the goal, and not just on Forgiveness Sunday. So, how does one forgive an abuser and 'heal' that relationship while staying safe mentally and physically? I think that's the hardest case. I, for one, would always want to start with the victim and his/her experience to guide. I think what a lot of abusers have trouble with is that there are some things for which you CAN'T make amends - you can't make it better or change the past or undo the damage. You cannot demand forgiveness. You can only choose to do better in the future, and work on untwisting those nasty dark parts of yourself that drive you to hurt and oppress others. None of my abusers have shown any sign that they care about my forgiveness one way or the other, and I figured out a while ago that if I made my well-being contingent on their being sorry or taking responsibility for their actions, I would never be healthy. One of my therapists said once that "Healing is forgiveness. ", and I think that's about right. I found practically every Christian take on forgiveness phenomenally unhelpful (and I'm not alone in that) - focusing on forgiveness primarily seems to just engender more guilt - and most abuse survivors already have more than enough of that to go around. Focusing on getting healthy seems to work much better - and sometimes, forgiveness is a side effect of that. For me, I realized that I don't know what that word would even mean in my situation, and decided that trying to figure that out was not a good use of my time. That just gave them a weird sort of control over me. After a great deal of hard work, I'm okay. My abusers' souls are their problem - not mine, and I have no interest in granting them absolution. (or frankly, what that would even mean. Can you grant absolution to people who think you're the one going to hell?) My job is to try to live with compassion and integrity now, and make sure they don't know where I live. I am with you on this Richard. It fits well within the 'realized eschatology' of John's Gospel. We too quickly partition eternal life to an after-life while there is much in the New Testament that points to a life that has been inaugurated in Jesus and we belong to here and now. ...and the Lord's Prayer dovetails into this seamlessly. The piece of the puzzle you've left out is the nature of the "sacramental priesthood" and role of the "presbyter/elder" whose prayers can forgive sins (James 5). If the role of the "elder" is to oversee the community then it is his role to discern who is forgiving/unforgiving and thus whose sins to bind and loose. 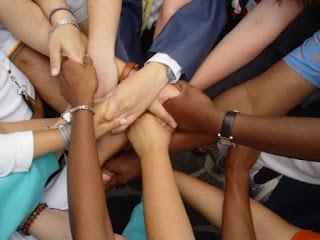 "Community" goes beyond individualism and individual relationships, it is truly "communal". Thanks for your thoughts on forgiveness. As a teacher and counselor at an addiction program, one of the pivotal concepts in a man's recovery that we teach is forgiveness. One of the passages we reference is this one in teaching about forgiveness. I like to think that this passage falls in line with what Paul describes as being adopted and inheriting all that the father has, even the rite to forgive as him. Paul even says later on, opposite to what Jesus said before the cross, "forgive as you have been forgiven". I'd like to think that is the case now instead of my forgiveness and reconciliation with god dependent on my forgiveness of others. That seems, in my understanding, to be more of a contract between me and God, and that my forgiveness for Joe isn't really forgiveness. What we teach is that forgiveness is a rite given to us and that it is between me and whoever may trespass against me. Certainly there are consequences for my unforgiveness, most suffered at my own hand. Just a few thoughts of mine. Thanks for sharing brother! I heard one person put this way, "forgiveness is taking you foot off their throat and allowing God to deal with them." Sounds more like making God a debt collector. This is profound and very much in line with what I have been thinking recently. Jesus often prayed that we would see God's kingdom take shape on earth. I believe that this is what he primarily came to teach. Not personal salvation, but communal salvation through a coming kingdom. Salvation is living in the place where the kingdom of God is in force. If we reach a state where people are living in harmony with each other, then we have found that great treasure that Jesus talked about (that pearl of great price). We have found the kingdom and that IS salvation. Forgiveness is begging that God will be merciful with them. Jesus illustrated that nicely. I wish that I knew how to square this with "every Christian take on forgiveness"--because Christian forgiveness is all about reconciling, and the community getting back together and moving on. Imagine a village, where you HAVE to live with that person, and in close relationship with people who love that person, for the rest of your life--not today's modern society where we can just, well, move on. Miraslov Wolff, Exclusion and Embrace, might help here. He wants to ask a question that is even harder than the question of how to get healthy--the question of how to get back together into community with people who did those things. I will also say that in many relationships, where there is not a callous and cruel abuser and an utterly innocent victim, the language of abuse gets coopted for much more complex problems. For those who are really abused by people who are really, and simply, abusers, your advice/ experience is most helpful. But I've seen more than one relationship where both parties try to name themselves as "innocent victim" and the other person as "cruel abuser" and get quite self-righteous about how "I can't change them, I can just stay healthy"--all without ever doing the hard work of forming a community among people who sometimes hurt each other (both ways). Yet let me reiterate that these are simply musings that exist to one side, and are completely secondary--your experience and your advice are wonderful. Brilliant stuff, especially the exegesis. Thanks. i wonder if we might push this even further to say that salvation/forgiveness itself is to be found our victims? this is rowan williams' argument in his beautiful book, the resurrection. the resurrected jesus confronts us first, not as victims, but as oppressors (see road to damascus etc) we are complicit in his death but he as the only perfect victim is able to offer a way out of the endless circularity of victim -oppressor, bully-bullied. forgiveness of sin becomes in no way about juridical pardon but about the offering of a new way of living which eschews completely violence and is based on gift instead. perhaps that can understanding makes some sense of the preceeding 'as i am sent so i send you'. our mission in forgiveness sins is not about pronouncing judgement but about holding out a new way of living based on the eternal selfless love of the trinity... if we don't offer that to the world then truly sins can't be forgiven and the cycles of destruction continue, and we are still in hell. This is definitely one of my favorites of your blog posts, Richard, thanks! i love this post so much. thank you for writing and sharing it. there are some great works on transformative justice and community accountability beginning to emerge, modeling ways of dealing with violence and trauma other than through retribution or punishment. _the revolution starts at home_ and _living in liberation: boundary setting and self-care for social change_ are great books on this, and incite! women of color against violence also has some resources on their website. i agree with other commenters that any process of forgiveness or reconciliation should be centered on the survivor's needs. as a survivor, i don't believe i or anyone owes a perpetrator forgiveness. for me personally, finding peace with forgiving someone is the thing i need to do for myself to heal. that does not mean that i necessarily want to be around that person, or that it's safe for me mentally or physically to be around that person. it also doesn't mean they want or care about my forgiveness (my abusers don't - some of them think they have done nothing wrong). i have been in a situation where someone committed an act of violence towards me and accepted that they had done something wrong and worked to change, and i forgave them, and we still have a relationship with each other. but that is really rare in my experience. forgiveness or reconciliation - if we choose to practice it - does not mean we cannot (or don't need to) have strong boundaries. Okay . . . I'm sorry. Really. Please forgive me. For all of you that are listening that I have pissed off over the years . . . I'm really sorry. Please forgive me. For all the insensitive things I have done to you. I'm really sorre. Please forgive me. For acting like I know everything. I''m really sorry. Please forgive me. For insisting on having things my way. I'm really sorry. Please forgive me. For being a jerk. I'm really sorry. Please forgive me. For not honoring my committments. I'm really really sorry. Please forgive me. For not doing all the good I knew to do. Please, please forgive me. Just as soon as you do . . . I will forgive you too! Then we can all be friends. You go first. Isn't that the way it's suppossed to work? Of course, if you hold an eschatology of universal reconciliation, then this becomes even more beautiful and exciting: we will all forgive each other in time (or rather, eternity). Perhaps there will even be, as Dana mentioned, a "forgiveness Sunday" --an ultimate "forgiveness Sunday".